When the Halloween pumpkins are gone, turkeys and napkins are ready to be placed on tables. A national holiday, Thanksgiving is celebrated in Canada on the second Monday in October and the fourth Thursday of November in the US, respectively. 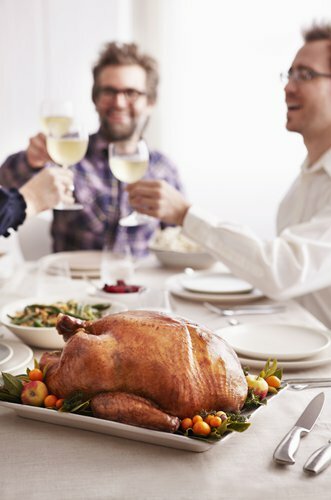 Thanksgiving holds a special place in the lives of a lot of North American expats. Thousands of kilometers away from their home country, it's a wonder how expats celebrate Thanksgiving Day in Beijing. Metropolitan interviewed some foreign friends, and here are their stories. Theresa Ahdieh comes from Seattle, Washington in the US. As a mother of two and an owner of two dogs and two cats, she's planning to squeeze in a makeshift Thanksgiving dinner with friends. She mentioned the people she wants to thank, and she said she's very thankful for her ayi and drivers "for their kindness and willingness to help out the crazy foreigner." "Ayi cleans, cooks, does the dishes, walks the dogs when I am away, accepts all deliveries, worries about my kids, and keeps us stocked with toilet paper and cleaning supplies! It's like I have a wife. I could not afford a housekeeper to come once a week in the US. Why would I want to leave Beijing?" Ahdieh said. Jesse Appell is a bilingual comedian and xiangsheng (crosstalk) artist. He told Metropolitan that he wants to express his gratitude to his xiangsheng teacher, and also feels thankful for his pleasant shopping experience on Taobao. "I am thankful for free shipping on Taobao (China's largest online retailer). I am not a Taobao-addict, but I did get a lot of stuff for Double 11 (the November 11 shopping festival featuring discounted products)," Appell said. Appell is not the only one enjoying his life in Beijing. Rich Akers, an Australian and a party person who has worked in Beijing for many years, describes Beijing as a "mixed bag." "Beijing has everything - big parties, lots of opportunities and challenges. But that's why we like it. It's a challenge, and like all challenges, it's rewarding. What I really love about Beijing and China is just the fact that it's not Paris or Rome, or London. I'm not impressed if you decided to go to Australia for your gap year. I love the fact that China is an off-road, out-of-the-box destination." "I'm thankful for the opportunity to live in Beijing where I can live among people from different cultures and learn so much about China and the world, away from home," Rapp said. Leaving Australia, she has been living in Beijing since 2011 and founded the Beijing Flea Market. Now she's like a total Beijinger. "The Beijing expat community is active, nice and supportive. I'm thankful I have the chance to channel my creativity and work with passionate, crafty Beijingers at the flea markets," Rapp said. Thanksgiving is not only about expressing gratitude to others, but also about eating and gathering. And turkey always plays the most significant role on this day. However, in Beijing where it's not so easy to get a turkey, many expats find other ways to celebrate a special Thanksgiving. Whitney Rhodes spent her first Thanksgiving in 2013. Growing up in the US, she always helped her family cook turkey during the holidays. But this week she plans to celebrate a Thanksgiving like no other. "There will definitely be some substitutes. People will try as hard as they can to make it as traditional as possible and stick to the traditional items, but some things might not happen," she said. Rhodes said she will replace turkey with roast chicken or duck. "If I can't get a turkey it'll be a real pain, but I won't be too disappointed," Rhodes said. For many, however, a Beijing Thanksgiving is an excellent opportunity to add a little Chinese taste to the usual palette. "We do a jiaozi-party Thanksgiving," said Anna Belkin, a long-term Beijing resident who not only eats the traditional Chinese dumplings alongside her turkey and stuffing but makes them as well. "One year we literally made hundreds of dumplings - it was so much food! "Belkin said. For some vegetarians, celebrating Thanksgiving in Beijing means a chance to get rid of the high-calorie meat and stuffing and embrace their favorite vegan diet. "There's very little on Thanksgiving that is vegan: Cranberry sauce, salad, and bread, that's about it," said Elizabeth Rowland from the US. "So I usually end up bending the rules and eating stuff that has dairy or turkey broth (like stuffing). Sometimes I make my own mashed potatoes or sweet potatoes, which are easy enough to make without dairy." Rowland said her veganism has presented her with an interesting entry into the thriving Chinese market for faux meat - even though "tofurkey" is still as hard to find in Beijing as the real thing. "China is really good at making delicious fake meat creations, so if I tried I could probably find some suitable fake meat option to replace the turkey," she said. Whatever your favorite fixin', it is always important to keep in mind the original meaning of the holiday - giving thanks for all you have, in Beijing and elsewhere. "If you look at [the quest to find the right ingredients] as a way to spice up your life for a day, you'll probably have fun," said foreign student Liz Carter of Peking University, "but if you want it to be 'just like back home,' you're just setting yourself up for disappointment. Still, the most important part is just being thankful for our good friends and family, which I find to be easier when I'm living in Beijing, because I'm less likely to take them for granted."